We’d like to thank everyone who made such a huge effort to get our seventeen Brexit Babies home. We needn’t have hurried so much! But with our transports being planned well in advance for vaccination reasons, we couldn’t risk potential issues at the border. 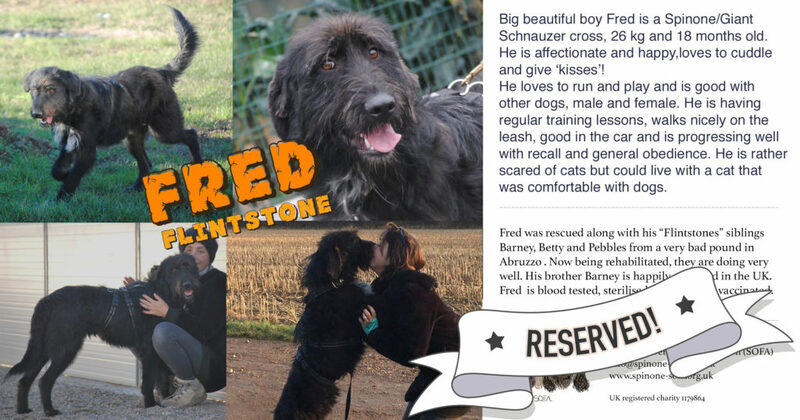 SO many people helped – rescuing and fostering, sharing, home checking, transport, and a huge fundraising effort with the auction to raise the funds to bring these dogs home. It is a wonderful team effort across borders. 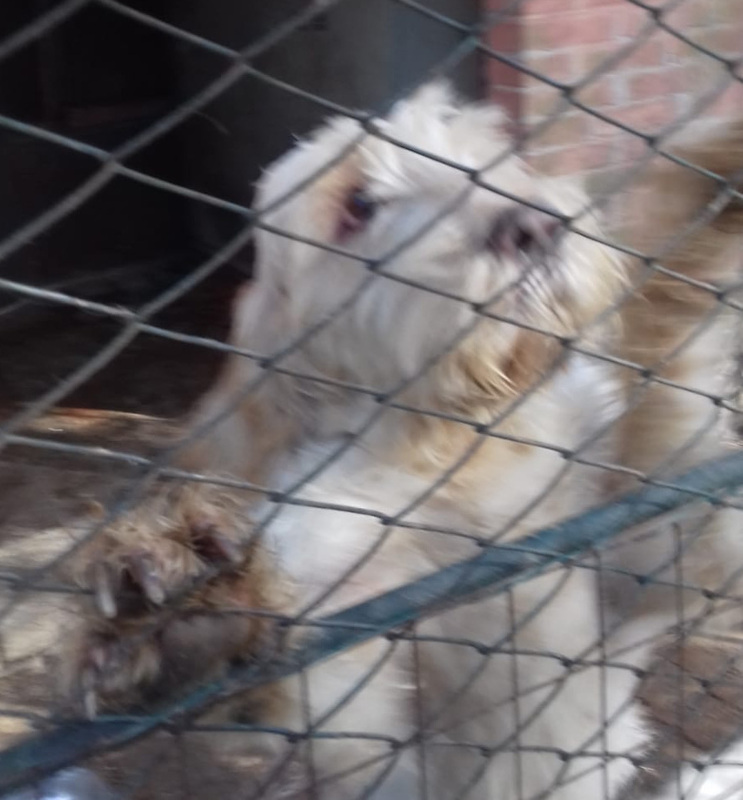 All of the dogs were found either via Facebook or rescue contacts in Italy. 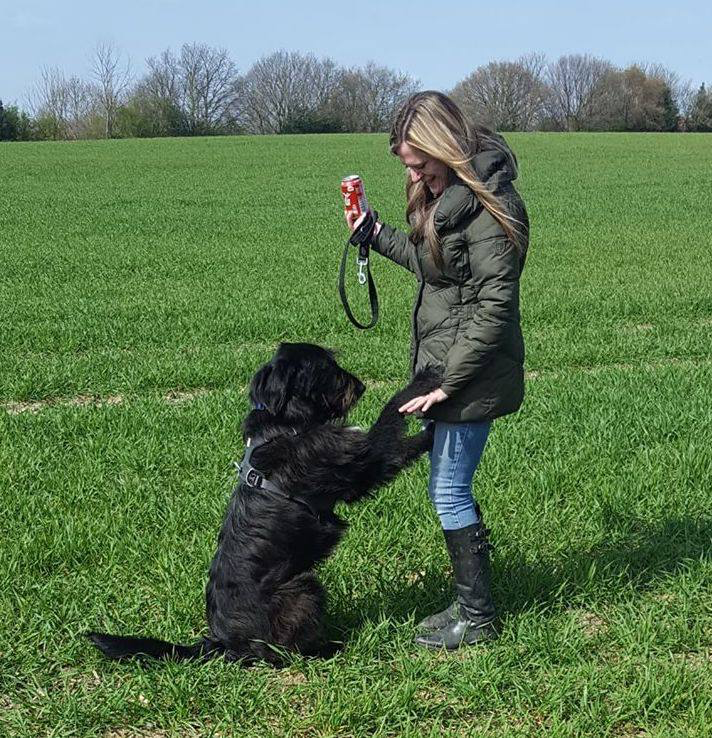 Many were unwanted or failed hunters – the end of the hunting season is always a busy time in rescue for these breeds as unwanted dogs are got rid of. A few were unwanted pets, and some were found in pounds with no knowledge of their origin. 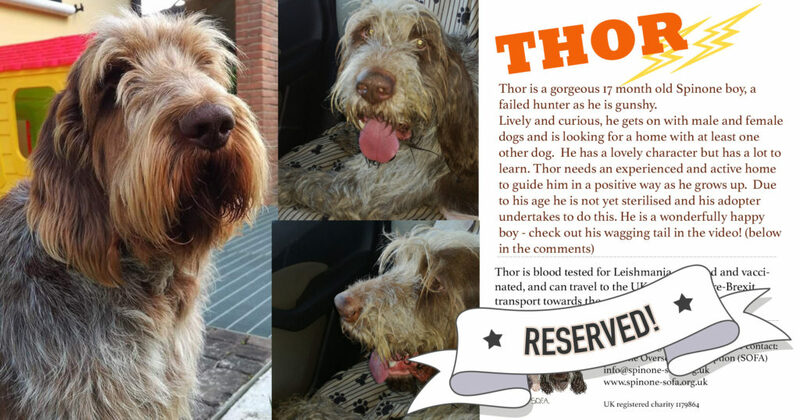 They were then fostered by volunteers in Italy whilst SOFA trustees searched for the right home for each dog by making and sharing cards with their details on Facebook, adding video where possible. Once a home was offered, we arranged home checks by experienced owners. In Italy, the volunteers prepared passports and medical tests needed for their travel. And on Facebook, many wonderful people donated and bought items at auction to get the funds needed to open these dogs’ cages. 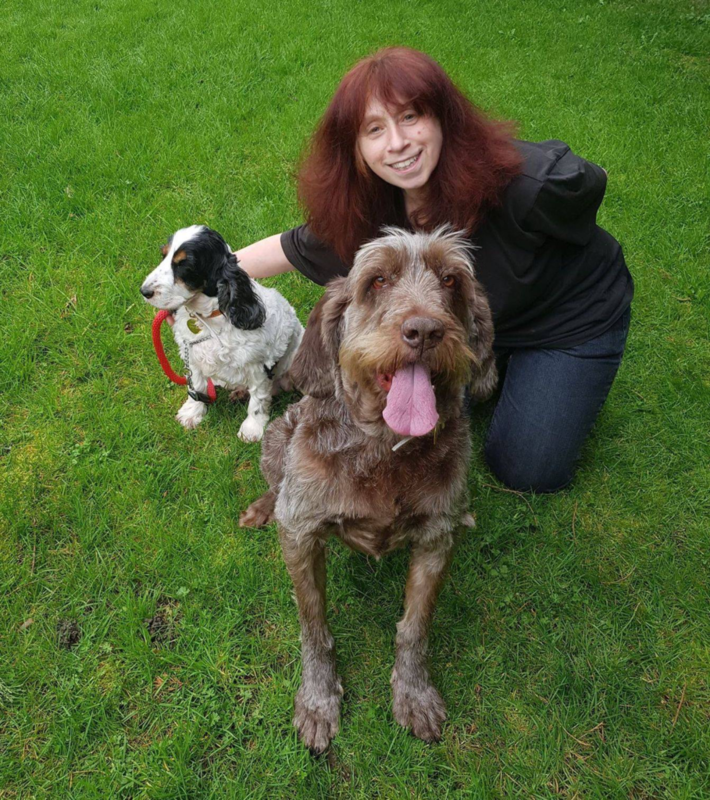 Paul Girdwood of VIPets, our DEFRA approved transporter, collected them in groups as they were ready to travel, and delivered them to their new lives across the UK, where you see them now. Now they are enjoying their new lives, thanks to all your support. Sweet gentle Frida was saved by a kind vet who refused to put her down when her hunter owner had no more use for her. Antonella raced to get her to safe foster with Paola, and she found a wonderful home to go to. 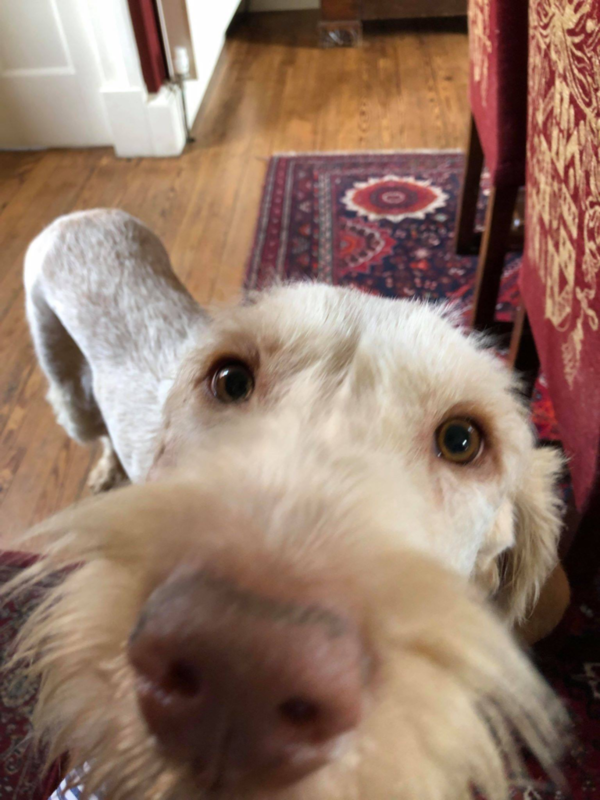 Now she happily stalks pigeons in the garden and with her new brother Oscar she is discovering the joys of the kitchen, the sofa, and best of all of a loving family. Gorgeous Grif – a failed hunter at just eight months old – was already passported, so he set a record for speed of rehoming…at home less than three weeks from posting his card! 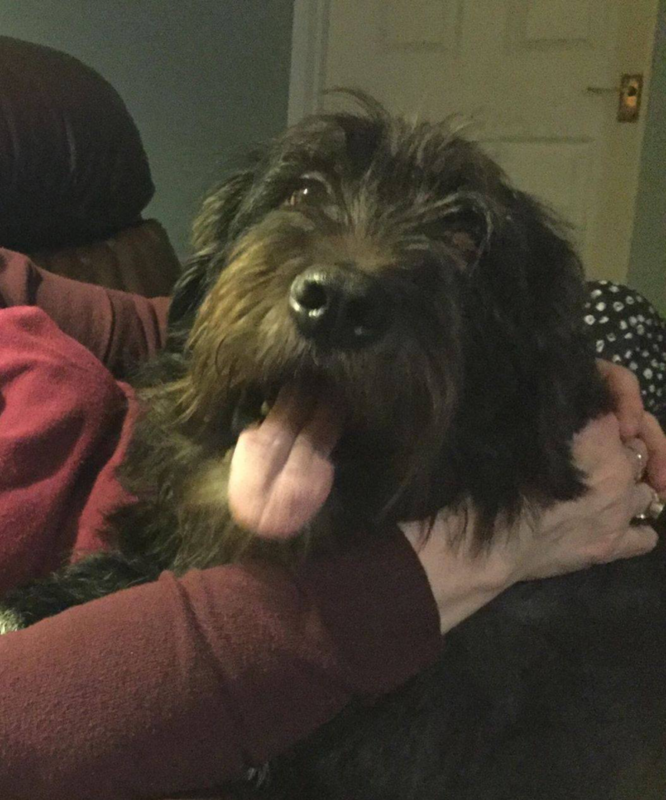 A beautiful happy boy, he loves his new family in Scotland (both humans and dogs. 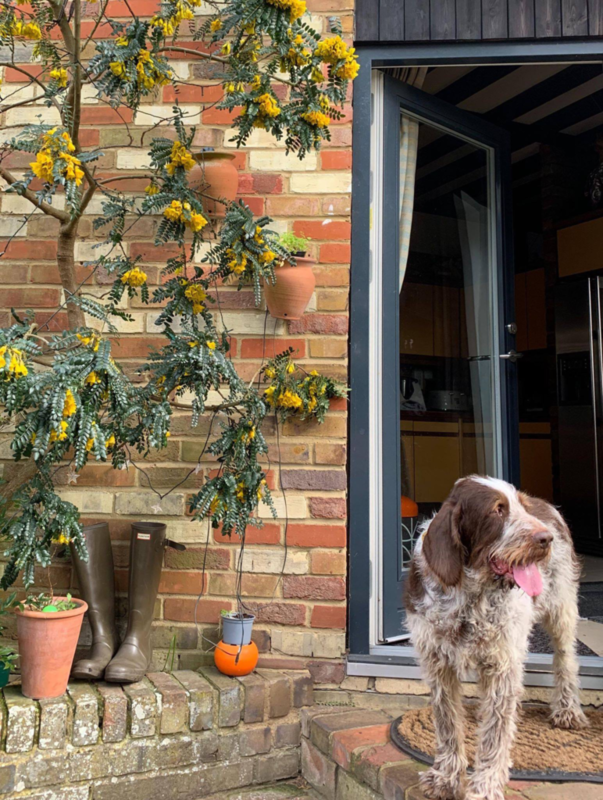 We’re all overjoyed to see this stunning youngster in his wonderful home! 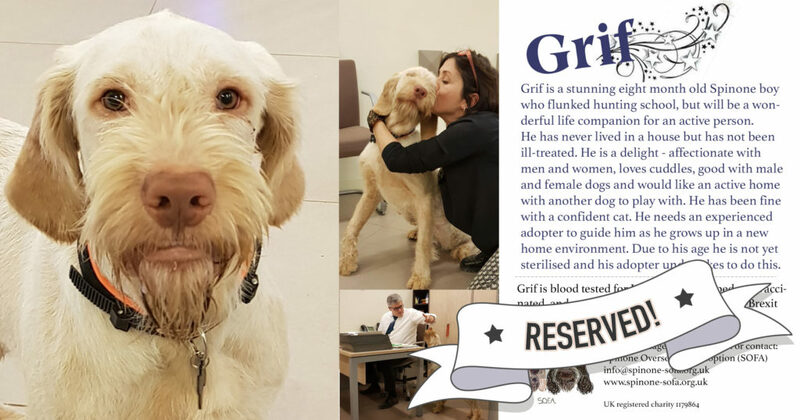 Have a long happy life, Grif, be sure to send us pictures! 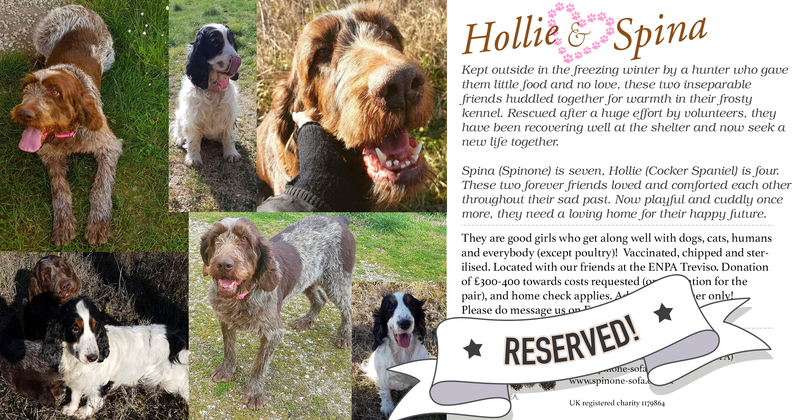 Bonded pair Spina and Hollie are home! 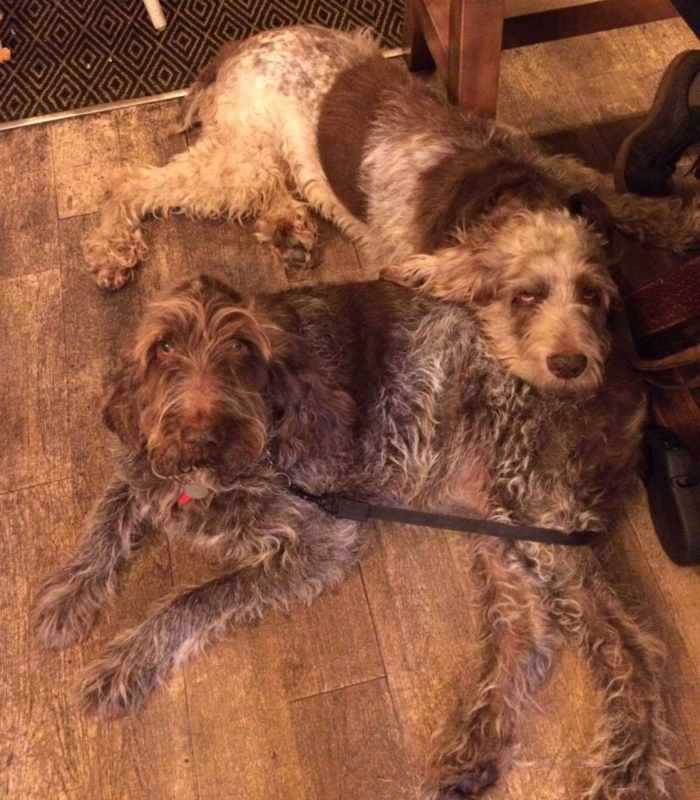 Paul Girdwood of V.I.Pets made sure they were together at all times so they travelled as comfortably as possible. These devoted friends travelled in the same cage, slept, and took all their breaks together on the journey. 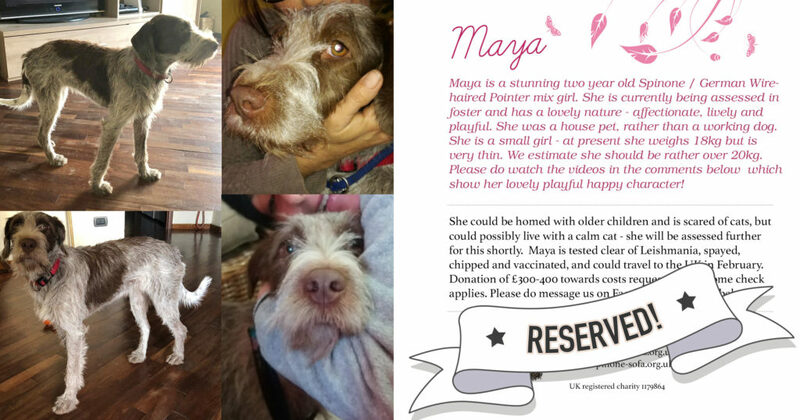 Sweet young Spinone mix girl Maya (brown roan) was a house pet, not a working dog. She arrived very thin but very glad to be loved and cared for at last. 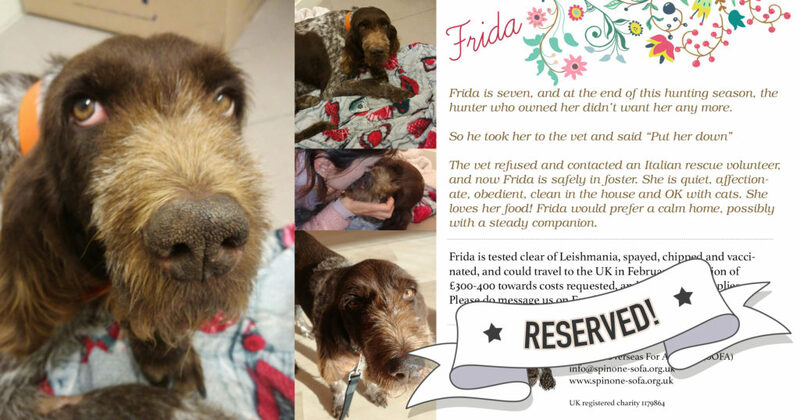 She missed her booked slot on the transport due to a passport issue but luckily was able to hitch a ride to the UK with SOFA Trustee Martha later on. 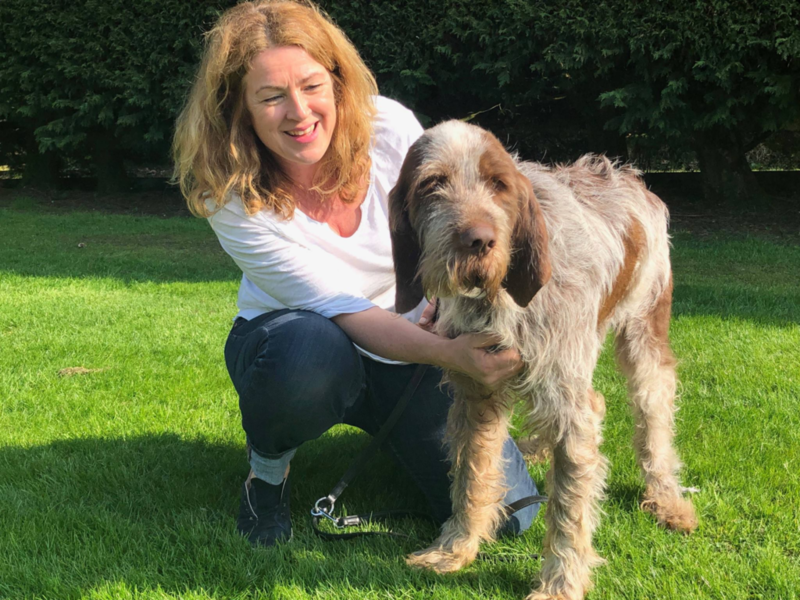 Though a little unsettled and grumpy on arrival – not surprising with so many changes – she is now doing very well and loves playing with her beautiful new brother, puppy Luca who is twice her size! She adores people and loves her new family . Betty Flintstone gave us all some heart-stopping moments. Although nervous, she had been settling well, playing happily in her new home and starting to bond with her new owners. Unfortunately startled, she scaled a wall she could not have possibly have been imagined to clear, and ran. A huge thank you to all who helped and most of all to the hero of the day, Antonella, who flew to the UK and was able to call the panicked girl to her. 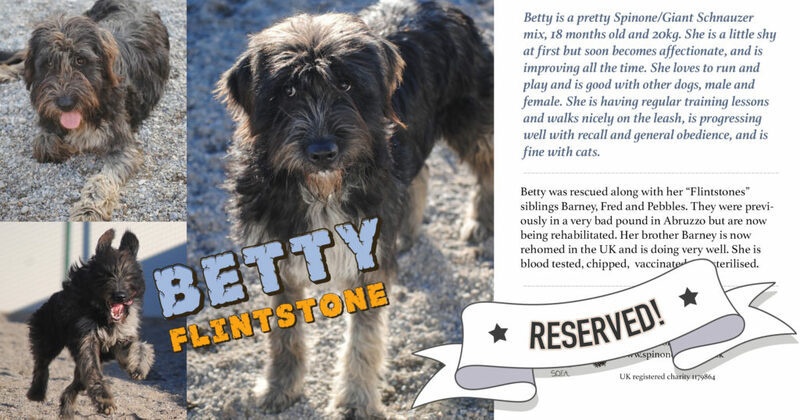 Betty is now doing very well and starting to get over her fears. 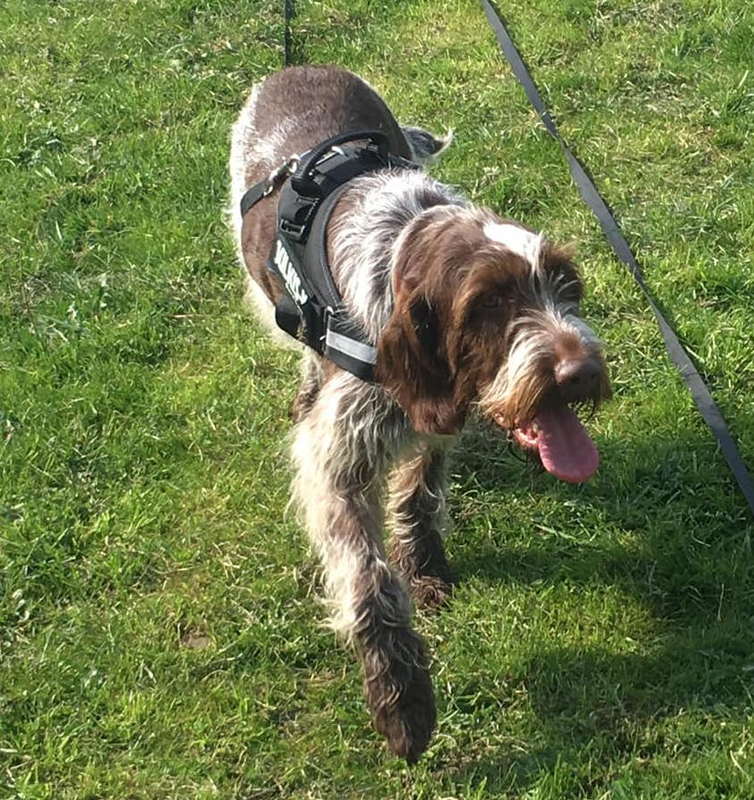 After spending some time in the garden, she’s now out on walks…safely on a double lead! 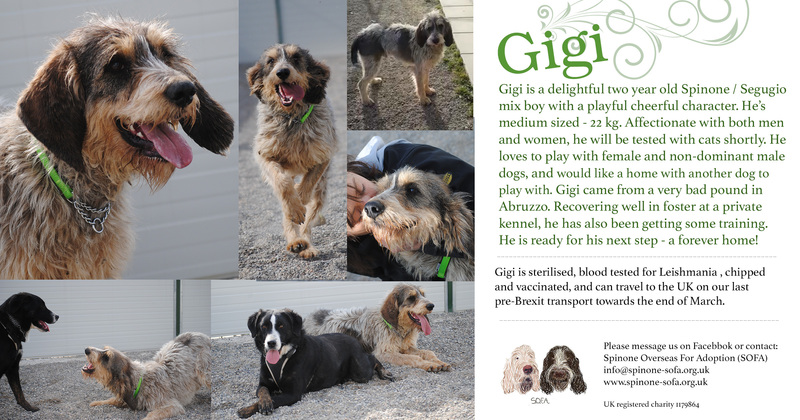 Gigi (now Luca), a mistreated hunter from a terrible pound, *just* made it onto the last transport before the original Brexit date. 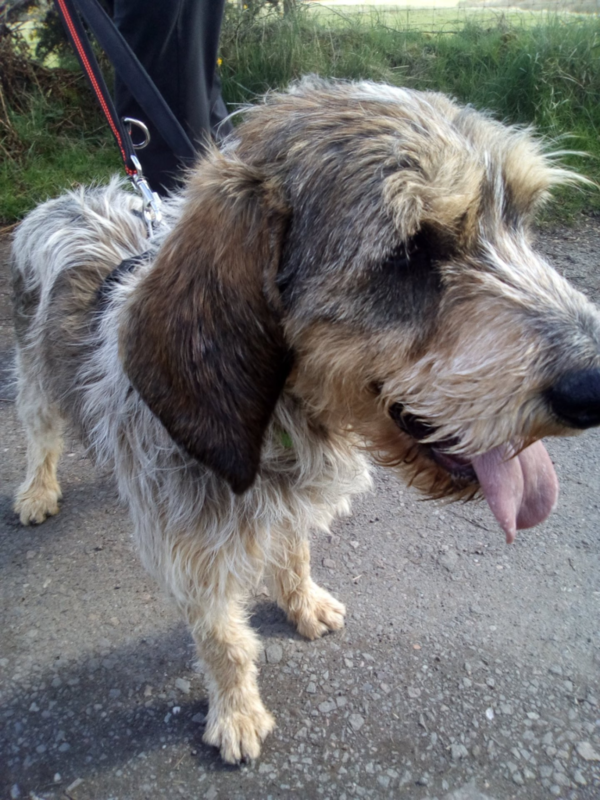 A beautiful and lively Segugio / Spinone mix, he is learning to settle in his wonderful new home in Scotland. Beautiful Gloria was not well treated by a hunter and does not like loud noises like gunshots. When rescued she was very thin and nervous of men, but is beginning the process of healing, helped by her lovely friend Enzo. 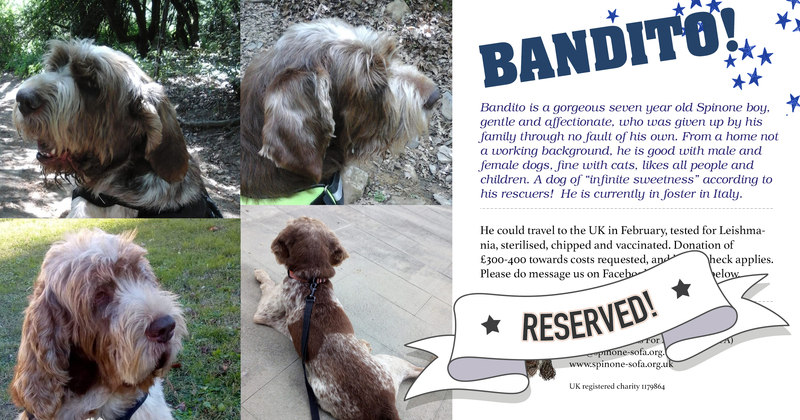 Affectionate, cheerful, well bred, a true Italian with a heart full of romance, who knows why Bandito’s family left him at the refuge? A pet dog, not a hunter, he charmed everyone along his long way home. Here he is resting his chin on beautiful Izzie, who welcomed him. 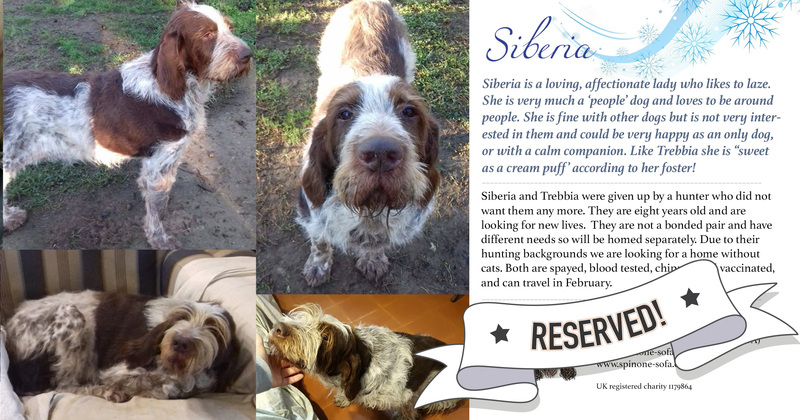 Siberia and Trebbia were given up by a hunter who did not want them any more after they had worked for him all their lives. 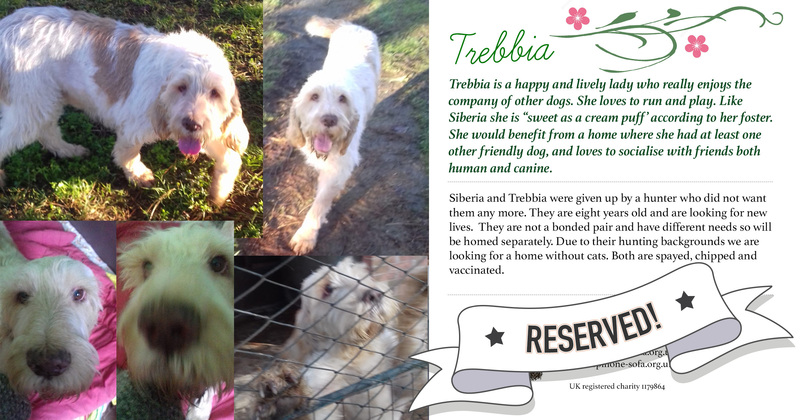 Both eight years old, they are not a bonded pair and had different needs so were homed separately – Trebbia is a social girl but Siberia prefers quiet devotion to her owner. A very happy 9th birthday to Siberia! Her first ever birthday in a real home. Happy, sociable white/orange lady Trebbia was another unwanted hunter, after eight years of service. 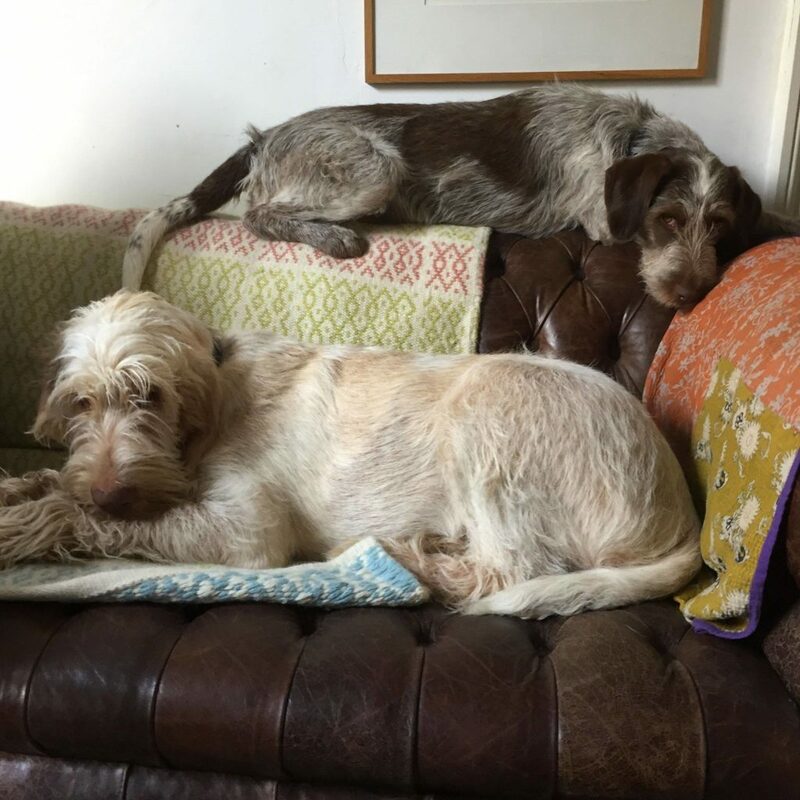 She is loving her life in the UK – her new brown roan brother Humboldt has welcomed her into a home full of love! 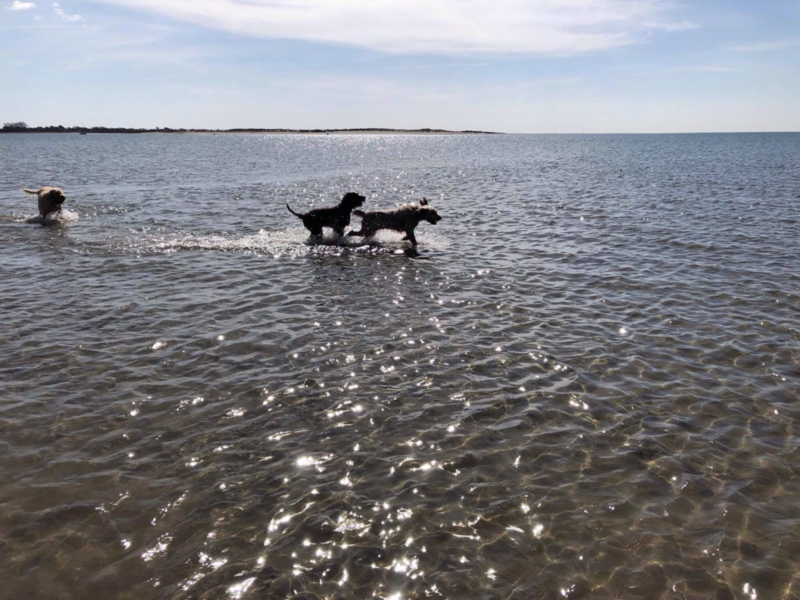 She has made many new friends already, loves beach life and is now on her first ever camping trip which she is thoroughly enjoying. Athena worked hard for her master. 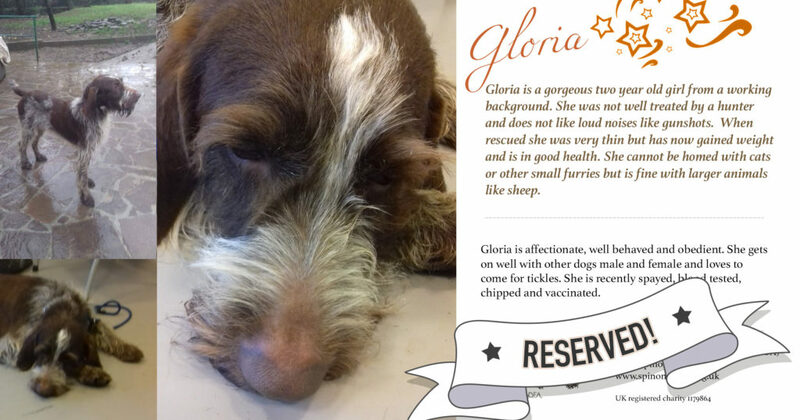 As a young dog, she did well in her showing classes and excelled in working competition. After the age of three, she had a litter every year for five years. At eight, rather than enjoying a well earned retirement, she was surplus to requirements. But, unknown to her, her luck was about to change. After a long wait, and careful and loving rehabilitation in foster, she finally came to her wonderful forever home. What a joy to see her happy. Buona Vita beautiful Athena!!! 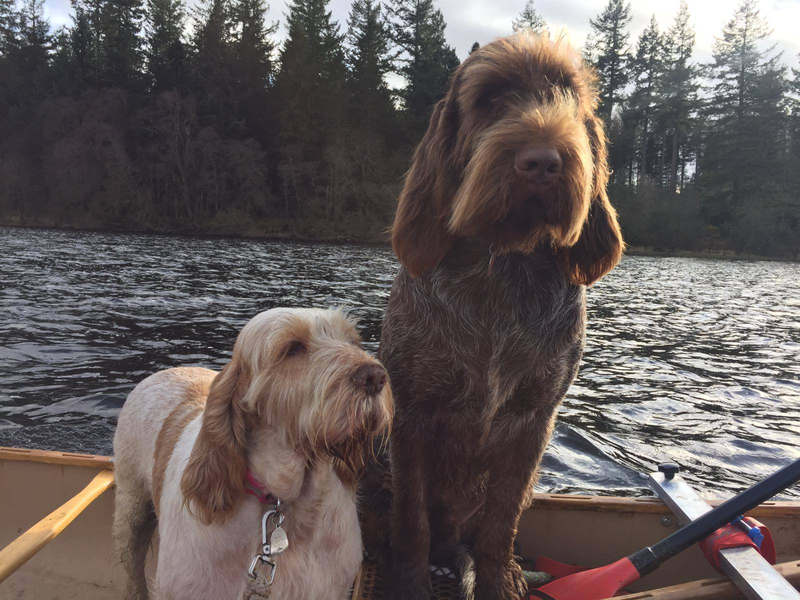 With our transports going so often due to the end of hunting season and Brexit, we had room for some paying passengers to fill in the gaps – Luce the chocolate-coloured Lagotto, English Setter Otto and little black puppy Hendrix. Their tickets made these last transports much easier to fund. Who knows the history of Luce? 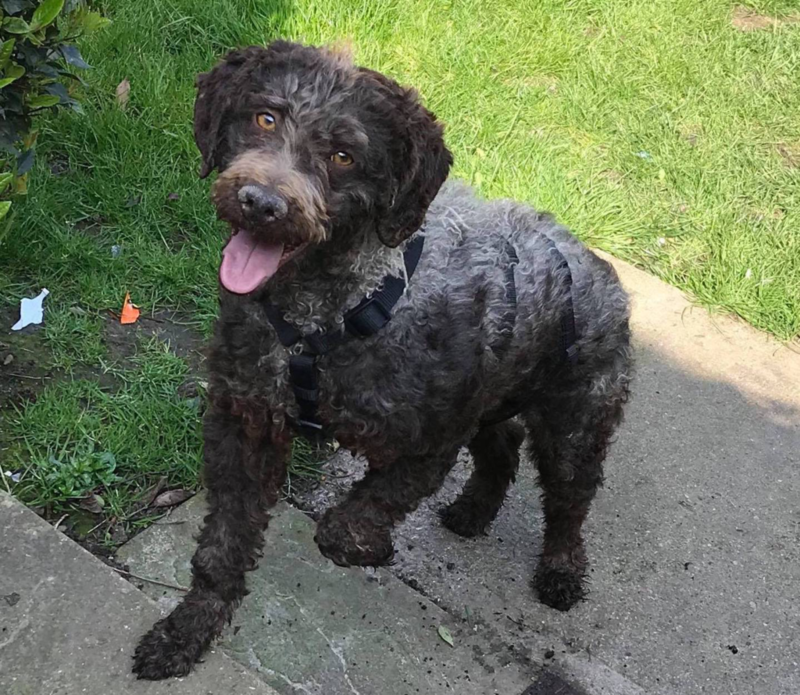 This gorgeous Lagotto Romagnolo was probably an unwanted truffle hunter. 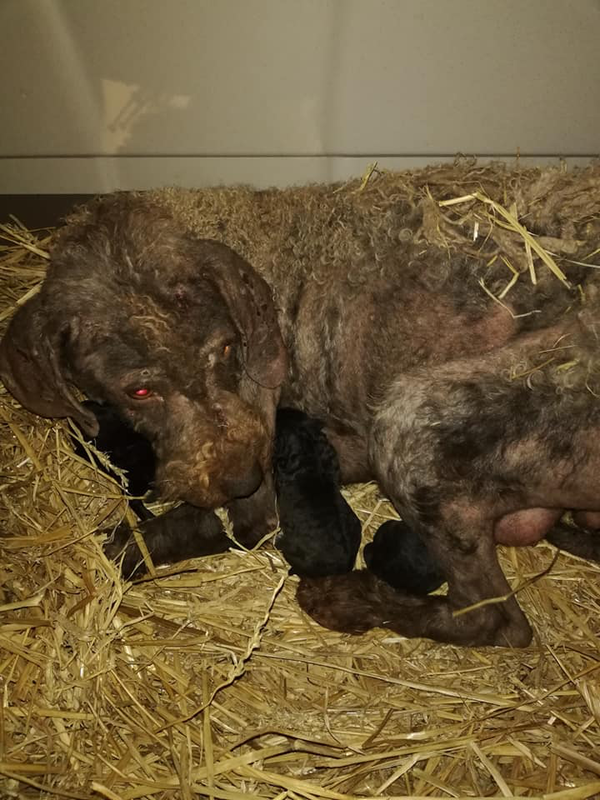 Abandoned pregnant in the hills near Abruzzo, she found a stable to crawl into to have her puppies, for some protection from the January cold. Rescued in a terrible state by dedicated volunteers, they named her Luce, meaning “Light”. With care, she recovered from her mange and was an excellent mother to her puppies, showing her sweet nature. 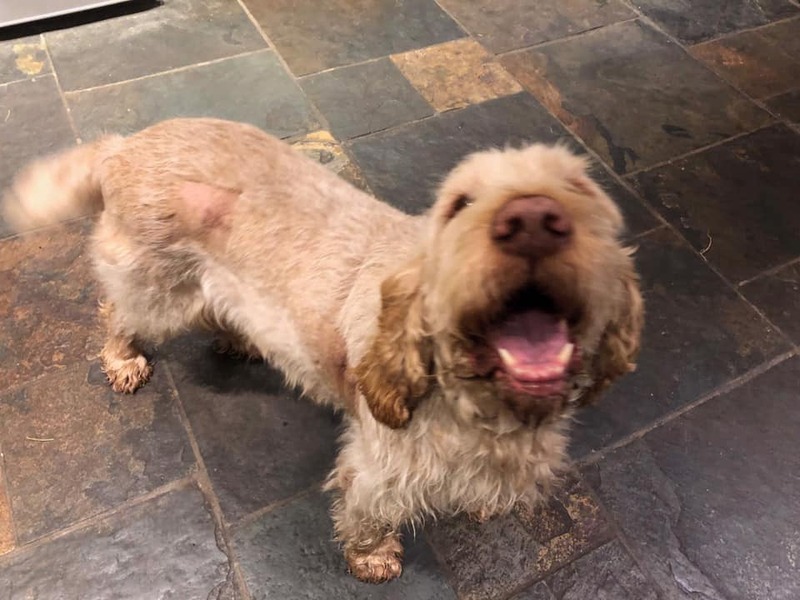 A lovely home was offered with another Lagotto in the UK, so Antonella undertook a marathon drive to Abruzzo to collect her so she could take her place on the transport, and found lovely homes in Italy for her puppies. She is unrecognisable today from the sad state of two months ago. Once again, an enormous THANK YOU TO EVERYONE WHO HELPED!